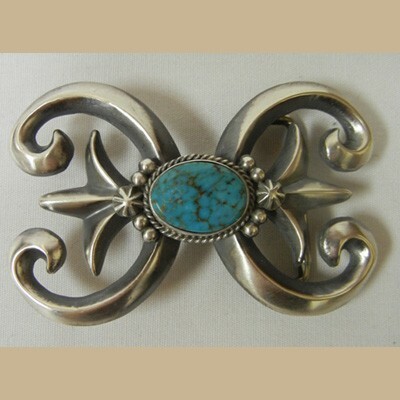 At Palms Trading Company, you’ll find many beautiful examples of hand-made Native American Indian jewelry. Much of that jewelry is sterling silver that is made using one of two techniques: sand casting and tufa casting. Since we covered tufa casting in a blog in February, we’re covering sand casting this month! Specialized clay-like molding sand is packed into a mold frame, one side at a time. The model for the piece of jewelry is placed into the center of the mold, and then more sand is packed on top. Once the sand has been packed, the mold is opened and the model is taken out to create an impression. Molten silver is poured into the packed and prepared mold and left to cool. Once it is cool, the mold is opened, the silver is taken out, and the extra silver (or sprue-button) is cut off. Using a rolling mill, the silver is pressed out into the desired thickness. It may take many passes to get the correct thickness. Rolling out the silver results in a product that is hard and brittle, so the artist heats and slowly cools the silver. This process is called annealing, and makes the silver soft enough that it can be worked into a final design. Once the annealing process is done and the silver is soft and malleable enough to work with, the artist tools and stamps the silver with designs. These designs are often traditional and may contain more than one pattern. The tools used to stamp and tool the silver are traditional and often hand-made. Once the designs are in place, the piece of jewelry is formed. For bracelets, the silver is placed over a mandrel, or forming cylinder, and shaped with a rawhide mallet that will not leave marks. After the forming, if any stones are to be attached, a setting is created for each stone that is then soldered on. Once any stones are set, it is time for the piece to be hand polished. The finished product is a beautiful and absolutely unique piece of hand-made art. If you’d like to add a unique piece like this to your collected, you can browse our online collection or come in to our store!